A professional writer—and a seasoned, schooled reader—will know on the first page of a novel whether or not he or she’s in the hands of a competent, skilled author. As a published novelist, it was immediately evident to me that Red Flags was well written. That’s not surprising, since author Juris Jurjevics has spent his career as a publisher and editor-in-chief. He knows good writing—that much can be assumed. But some people become editors because they can’t put words to the paper themselves to tell a compelling story that sustains itself over 400 pages. Even though many people think they can write a novel, in reality, very few can. Red Flags demonstrates that Mr. Jurjevics can not only recognize good writing, he can produce some of his own, too. Red Flags opens with a woman seeking information regarding the circumstances surrounding the death of her father, Colonel Dennis Bennett. She lands on the doorstep of former Army captain Erik Rider, who served under her father’s command in 1966 in the Pleiku province of South Vietnam’s Central Highlands. After this initial setup—which author Jurjevics conveys beautifully—the daughter’s determination to get at the truth and Rider’s determination to keep that part of his life buried—make for an intriguing conflict and, of course, tease the reader into finding out what happened: Why is Rider so hesitant to talk with her? What is he hiding? Ultimately, she wins—because Bennett’s death forms the crux of the story behind Red Flags—and Rider begins his story of the events leading up to, and including, his commanding officer’s death. 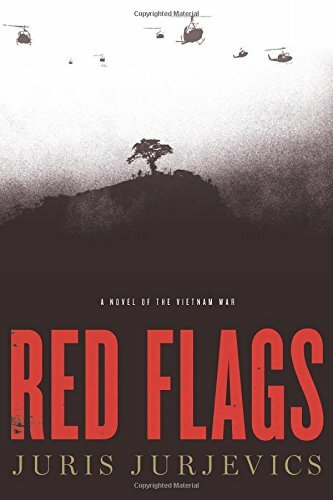 Red Flags lays bare the quagmire that was the Vietnam War, told through young Captain Erik Rider’s eyes as he navigates the nuances of the native cultures and allied command structures under whom he serves while carrying out a covert spy mission for the Army’s Criminal Investigative Division. But it’s clear from the outset that Red Flags is not your typical war novel; while there are combat scenes, they are short-lived, the battles more strategic and psychological rather than prolonged, artillery-based slug-fests. And that fits with the novel’s more cerebral tone: Red Flags focuses on the depth of Vietnamese graft, bribery, and profiteering, as well as Rider’s attempts to peel back the onion of deception to find out who is behind the operation he was sent to investigate. Mr. Jurjevics writes with a confidence and level of detail that can only come from a Vietnam War veteran. His descriptions and depictions of the land, people, the actions that they take, and the cultures figure prominently in the characters’ personalities. Although Mr. Jurjevics did, in fact, serve a 14-month tour, he spent a great deal of time doing additional research to bolster his knowledge, reportedly interviewing fellow veterans as well as obtaining declassified documents, maps, and incident reports. He also claims to have read over a thousand books on the topic—an exaggeration? It’s not surprising that Red Flags at times reads like a soldier’s field manual: a how-to guide on the execution of covert missions in a jungle. It’s a style that brings to mind former SAS officer Andy McNab’s series of thrillers—a compliment, not a criticism. Mr. Jurjevics draws the reader into the narrative, as if he is experiencing the mission alongside Rider as he huffs through the jungle in wet boots, bugs feasting on his flesh. And while the novel sometimes gets dense with acronyms and incomprehensible soldier slang, it does not overtly bog down the plot. Red Flags is a well-executed and enjoyable story that provides an in-depth look at the Vietnam War, the various peoples who populated the region, the intersection of the various cultures, their motivations, the rampant profiteering—and expounding subtly, just beneath the surface, the impossibility of America’s mission in southeast Asia. In that sense, Red Flags makes a powerful statement on the Vietnam War without being preachy. While we lost the war, one would have hoped that the lessons learned could provide our leaders with wisdom and perspective relative to future conflicts—especially since the issues facing our troops 40 years ago were not dissimilar to the issues facing the soldiers engaged in our recent forays into Iraq and Afghanistan. Unfortunately, the lessons from Vietnam fell on deaf ears. It is hopeful that a novel like Red Flags will hopefully serve as a powerful reminder going forward about the near futility of wars in sustaining ongoing peace in foreign lands. Alan Jacobson is the bestselling author of many thrillers, including The 7th Victim, Crush, and Velocity. His latest, The Last Codex, will be released November 2015.